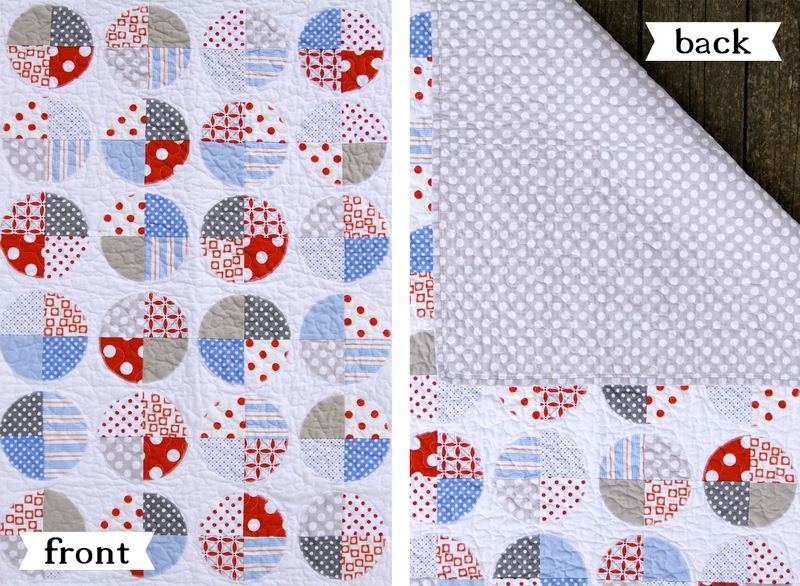 Did you notice anything different about Griffin's quilt in his nine month post? It's done!! So, his room still isn't finished, but at least his quilt is. I love how it turned out. My mom did a fabulous job. And she was really patient with me. The pattern had a border around the outside of the quilt, but when she put it on I didn't really like it. I just liked the circles. So she took off the border and added more circles. That's why it took so long. Super nice mom, I know. The front is all circles. And the back is gray polka dot (Ta Dot Stone). My mom used this pattern for the quilt (minus the border). I love love love your quilt. I remember when my son was a baby. I had a quilt (the kind you stitch by hand the old fashioned way) on my quilt frames. I worked on it when I could but finally....my mom finished it when he was about 3 years old. Kinda funny that it took that long. I did have good intentions. It is a darling quilt and yes, you will get the room done someday. Little Griffin won't care. All he will care about is "when do I eat?" and "when do I play in the water or play with my brother?" Your boys are so cute and they look like they are happy little guys (well, for the most part!! Ha Ha). I think that is because they have parents who have such good hearts and love them so very much. I can tell there is a lot of love in your world and that you have a lot of faith and trust in your life. Your daughter must so proud of her mama and daddy and her baby brothers!! Love it! Such a great keepsake! I did notice and I absolutely LOVE IT! Really love it, one lucky momma and baby boy to have a granny that makes quilts :) I know what you mean about the room! ;) Levis was worth the wait, I am sure Griffins will be too! Hi, Jessica! I love the quilt. It's precious and will "grow" with him. My friend who is a "super quilter" has offered to make quilts for my 5 grandchildren. I know, she's a SUPER friend, too. I wish you were close by to help me with the colors. I do machine embroidery and she quilts so I'm going to embroider some of the squares and she will piece the quilt. I need HELP deciding on all the colors. The children range in age from 14, 13, 10 (only boy), and 2. I want something that will "grow" with them. SO difficult to decide what to do. Any ideas? I love that you posted your fabric sources! I always love your choices and I am getting sick of my local store selection.